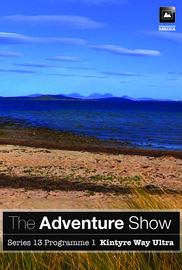 The Adventure Show returns for a new series with a visit to the rugged Kintyre Peninsula to join athletes in one of Scotland's most scenic races - the Kintyre Way Ultra. The Adventure Show returns for a new series with a visit to the rugged Kintyre Peninsula to join athletes in one of Scotland's most scenic races - the Kintyre Way Ultra. With no less than 1,300 metres of ascent and over 35 miles of rough terrain, this is a tough challenge for every runner. Also on the programme, we'll be meeting an inspiring athlete who is proving that living with epilepsy doesn't prevent you from achieving sporting success at the highest level. Buy all available Series 13 episodes! NB: The Fort William Mountain Biking is not included due to licensing.